Create a colourful hedge with year-round interest and colour. 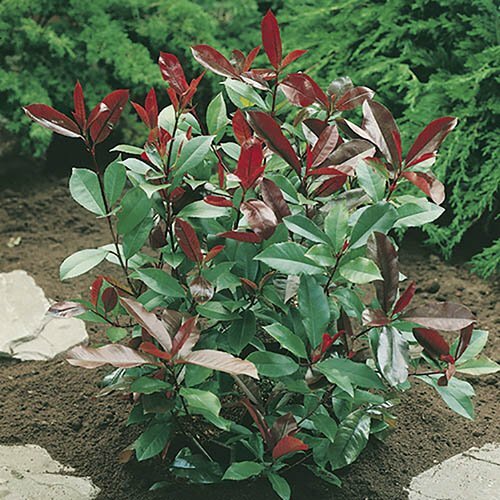 Fabulous evergreen shrub, with bright red leaf tips, that stay red-purple for the first year. Great for hedges and screening, as reasonably vigorous growers, or as backdrop for year round colour. Each spring new shoots are an amazing bright red colour, stunning in effect. Supplied as a pack of 10 plants, established in 9cm pots, ready to plant out (1m apart for hedges). Photinia 'Red Robin' is a very popular, vigorous evergreen shrub, which boasts glossy, bright red leaves, which give a spectacular display in spring and summer. The leaves gradually change through a mix of oranges, purples and bronzes, maturing to deep dark green. The newest shoots retain a dark red glow all year. Red Robin is often planted as an ornamental shrub or as a fast-growing, dense hedge. It produces clusters of small white flowers in spring, sometimes followed by red fruit - but it is the bright, blood-red spring foliage that really sets this hedging shrub apart. The colour is really intense and unusual, especially so early in the year, and being evergreen, has year round interest. A great and versatile shrub for hedging, screening, or as a backdrop, yet easily manageable in smaller gardens with annual pruning. Grows up to 30cm a year once established. Supplied as a pack of 10 plants, established in 9cm pots, ready to plant out. Space 1m apart for the perfect hedge. Keep plants well-watered to avoid leaf drop in the summer. Your Photinia will grow approx 30cm each year, and should be trimmed in spring and summer or can be left informal, just being trimmed down when needed. Photinia prefers a sunny site but will tolerate partial shade and although frost hardy young plants should be protected in winter until established.